Lolcats. Salsa dancing. Unrequited love. 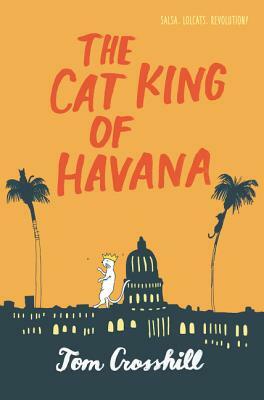 Tom Crosshill's smart and witty debut teen novel treads a colorful coming-of-age journey from New York City to Havana that will appeal to fans of books by Matthew Quick and Junot Díaz. When Rick Gutiérrez—known as "That Cat Guy" at school—gets dumped on his sixteenth birthday for uploading cat videos from his bedroom instead of experiencing the real world, he realizes it's time for a change. So Rick joins a salsa class . . . because of a girl, of course. Ana Cabrera is smart, friendly, and smooth on the dance floor. He might be half Cuban, but Rick dances like a drunk hippo. Desperate to impress Ana, he invites her to spend the summer in Havana. The official reason: learning to dance. The hidden agenda: romance under the palm trees. Except Cuba isn't all sun, salsa, and music. As Rick and Ana meet his family and investigate the reason why his mother left Cuba decades ago, they learn that politics isn't just something that happens to other people. And when they find romance, it's got sharp edges. Breaking the fourth wall, Rick speaks directly and engagingly to readers, infusing Crosshill’s first YA novel with wry, self-effacing humor....Crosshill’s big-hearted novel shines. Cosshill’s debut novel manages to make a book full of weighty subjects into a seemingly light read. The result is a funny, sometimes sad portrait of a teenager trying to connect with his roots and realizing that the world is more complicated than he ever wanted to know.